5/5 HUGE show at Ardmore Music Hall! This Saturday, we are so excited to be a part of this KILLER line-up. We are starting the night off, opening for two of our favorite live bands. You really DON'T want to miss this one! 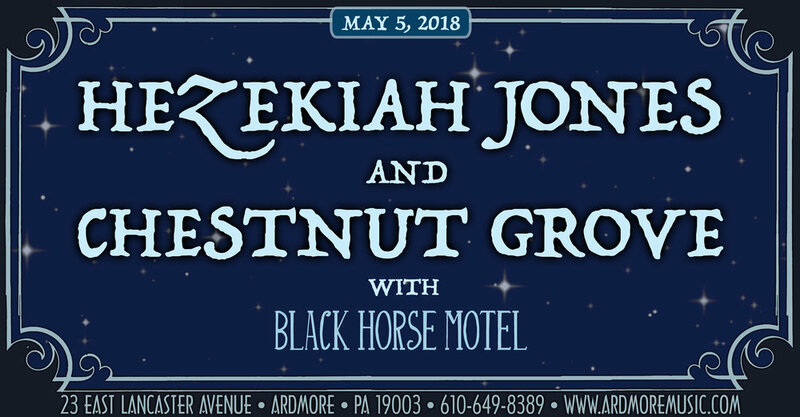 Hezekiah Jones is a seasoned genre-defying band rooted in writing finely crafted songs and performed by a stellar line-up of Philadelphia’s best musicians. Through their 9 years they have coalesced into a band that effectively blends Americana with infusions of an eclectic mix of New Orleans style Jazz, Harmonic Folk and Beatles-like Pop-Rock. Pennsylvania bred, close knit group of youngin' , multi-instrumentalist rock n' rollers who put on one helluva live show. Since 2012 the group has been creating music together combining a variety of their individual influences while independently performing over 200+ shows, and self-producing a debut EP & LP. They're back in the studio this Summer 2016 to record a fresh EP with Bill Moriarty (Dr. Dog, The Districts, Hoots n Hellmouth) in combination with an online rebrand and their first national tour in 2017. There are exciting things in the works for this family style band of creative characters with some serious growth potential in the live space. New EP 7/20 & Release Show 7/21/18! Wow! We won 2 Homey Awards!